I’m fortunate to have been invited to attend the 5th annual Learning Analytics and Knowledge Conference (LAK ’15), where I will take part in the Doctoral Consortium (DocCon). I’m excited to get feedback on my dissertation design from the DocCon organizers and my fellow graduate students. Aside from a 15 minute presentation, we were also asked to design a poster for the poster session on Wednesday. I took the opportunity to design a visual “elevator pitch” in the form of the graphic below. Students usually strive to do their best in their coursework. 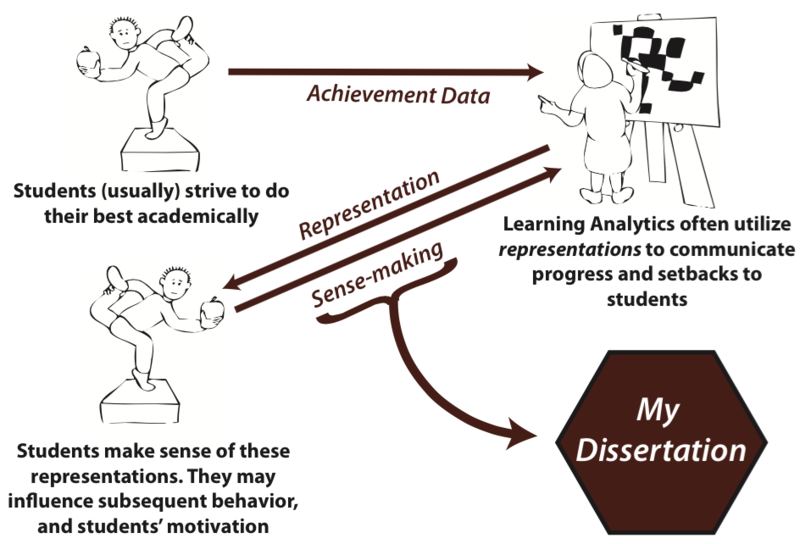 Learning Analytics often take students’ achievement data (e.g, grades on exams, papers, etc. ), and use the information to generate representations that communicate students’ progress and setbacks in their courses. The presumption: more information = good and generative of adaptive behaviors. Students see these representations (on a dashboard, perhaps), and may adjust their strategies accordingly. However, before this happens they first have to “make sense” of the representation. During this sense-making process, the representation may have motivational implications for students. For example, what happens if students see their average course performance displayed over time, as well as their classmates? Achievement Goal Theory suggests that such comparisons may, in fact, be motivationally maladaptive for students. As with most things it depends on the person as well as the context. My dissertation, Exploring and Measuring Students’ Sense-Making Practices Around Representations of their Academic Information, is focused on better understanding this process. I utilize a multi-methods design that begins with interviewing students to explore how they make sense of various line graphs depicting different scenarios. These interviews will then help me draft and validate a measure that captures students “information motivation orientations” (working tittle). Once I finish my dissertation I hope to come away with both a validated measure, as well as design implications that can help inform the design of future learning analytics interventions. Have feedback? Use the comment box below to share them, or contact me directly. I am a Provost Postdoctoral Scholar for Faculty Diversity in Informatics and Digital Knowledge at the USC Rossier School of Education. My research focuses on the design, efficacy, learning and motivational implications of learning analytics applications.